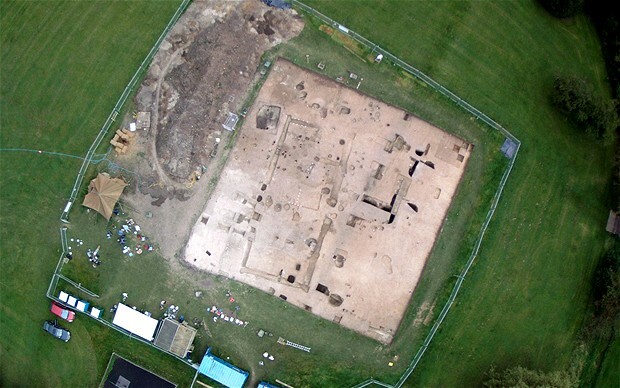 An Anglo-Saxon feasting hall unearthed beneath a village green in Kent could represent the "tip of the iceberg", according to archaeologists who believe it lies amid an entire complex of ancient buildings. The rare 7th to 9th century hall, which would have accommodated up to 60 people during royal feasts, was the first to be discovered in more than 30 years when it was excavated by Reading University experts this summer. But further developments are expected over the coming years as researchers plan to scour the surrounding area in the hope of finding an entire network of other buildings. Feasting halls like the one uncovered in Lyminge, which contained jewels, animal bones and a broken horse's harness, were always part of a larger complex of houses built for accommodation and other ceremonial purposes during royal visits, experts explained. The initial trench in which the hall was first glimpsed also contained the foundations of another building, suggesting the newly discovered site is no exception. Dr Gabor Thomas, the excavation director, said: "Probably the best excavated complex is a site called Yeavering in Northumbria which produced what seemed to be some kind of grandstand. "One of the purposes of these sites is for assembly, and it is argued that is precisely what it was for – people would have sat to hear proclamations and laws being passed. "It could be that we will find something that is highly distinctive in terms of what is found in Anglo-Saxon settlements of this period, the chances are quite high that we will find something we haven't seen before." The foundations of the feasting hall are "remarkably" well preserved and may be particularly important because they were found in Kent, the most powerful pre-Christian Anglo-Saxon kingdom, he added. Ruins of a monastery were also found at the same site, suggesting it could contain tantalising clues about the transition from paganism to Christianity. Dr Thomas said: "We have also got 'what happened next'. We have got the church and the monastic settlement that grew up around it, which have been excavated since 2008. This is one of the only areas where you have got the full transition from pagan to Christian."